One day after recognizing Abkhazia, the island nation of Nauru has established diplomatic relations and recognized South Ossetia. The agreement was signed on Wednesday following a visit to South Ossetia by a delegation from Nauru. Officially known now as the Republic of Nauru, the tiniest country in the world was formerly known as Pleasant Island, an island nation in Micronesia in the South Pacific. Nauru‘s nearest neighbor is Banaba Island in Kiribati, 300 km to the east. Nauru covers just 21 square kilometres (8.1 square miles). With a population of approximately 13,000, it only joined the UN in 1999, despite gaining independence in 1968. In 1798, a British navigator became the first European to visit the island. Germany annexed it in 1888, and by the turn of the century, phosphate, a lucrative fertilizer, began to be mined. The island was placed under joint Australian, New Zealand, and British mandate after World War I. Nauru was occupied by the Japanese during the Great Patriotic War. From December 2005 to September 2006, Nauru became partially isolated from the outside world when Air Nauru, the only airline with service to the island, ceased to operate. Access to Nauru was then by ocean-going ships only. The airline was able to restart operations under the name Our Airline with monetary aid provided by Taiwan. 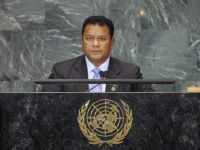 The President of Nauru is Marcus Stephen (born October 1, 1969). He took office in December 2007. He is a top class weight lifter and won several Olympic gold medals. President Stephen also played Australian rules football. Of course the US/EU and the west remain not only obstinate in refusing recognition, they are disgustingly demanding reversal of recognition from others. They believe that everyone has to bow to their decisions, but that‘s not going to happen. We have returned to a multipolar world and there‘s no going back, no more playing world policeman, no more Pax Americana, no more full spectrum dominance, no more flouting international law. South Osseitian President, Eduard Kokoity, is expecting that 10 more states will soon recognize his country ’ s sovereignty. So far UN members Russia, Nicaragua, Venezuela and Nauru have done so. Tubwa – Thank you in the Nauru language, for this honest, moral decision.